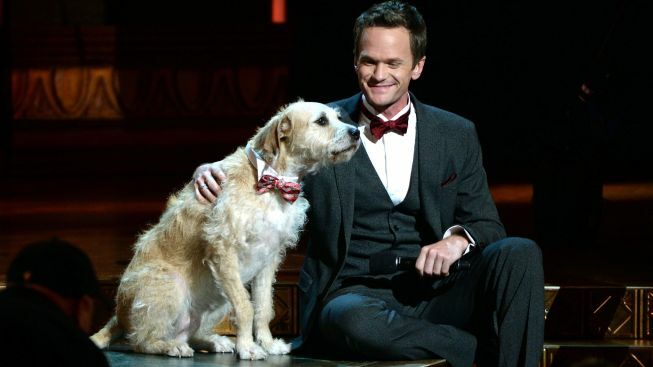 Neil Patrick Harris Signs On for "Hedwig"
Neil Patrick Harris, pictured with canine sidekick Sandy at the Tony Awards on June 9, will headline the coming Broadway premiere of "Hedwig and the Angry Inch." Busy awards show host Neil Patrick Harris has signed on to star in the Broadway premiere of John Cameron Mitchell and Stephen Trask’s musical “Hedwig and the Angry Inch,” coming next spring. Creative team members, additional casting and a home for the production will be confirmed at a later date, producers said. Harris is a bankable Broadway star, thanks most recently to his engagement as host of the 67th annual Tony Awards, the highest-rated broadcast in more than a decade. He has starred in three Broadway productions, including “Assassins,” “Proof” and “Cabaret,” at Studio 54. He most recently tackled the leading role of Bobby in the New York Philharmonic’s concert version of Stephen Sondheim’s "Company." “Hedwig,” a musical comedy about a fictional rock and roll band fronted by a transgendered singer, began Off- Off- Broadway at Westbeth Theatre, and then ran more than two years at the Jane Street Theatre beginning in February 1998. The 2001 film, directed by Mitchell, won the Audience Award and Best Director Awards at Sundance.